HIS CRIA CONTINUE TO WIN CHAMPIONSHIPS! A male offspring has won three Judge's Choice Awards this spring in three shows (including Level V!) Look at his offspring as you go thru the spring show circuits...including AOBA Nationals and Futurity! Full Accoyo Bred to Michelangelo! 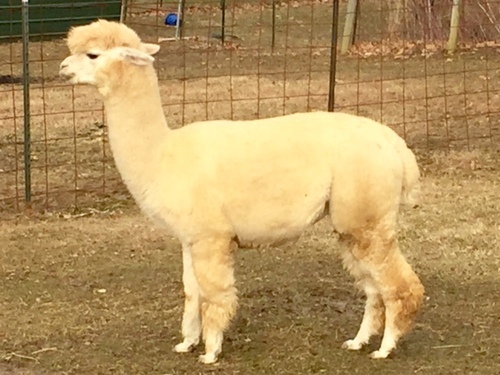 Cordera is a pristine FULL ACCOYO ribbon winning female with genetics that are loaded up with alpacas that are multi champions that have made multi champions – proving these genetics are ponent and passed along! On top of them being an elite list of ACCOYOS, they are also ones that have covered COLOR (Royal Fawn, Mariah, Augusto, Arctic)!! LLC & TKAF Black Accoyo Jackpot is the ONLY SOLID BAY BLACK FULL ACCOYO MALE ON EARTH! Yes Sir – No Contamination! Truly EXTAORDINARY in EVERY SINGLE WAY! • Extreme ACCOYO density. Skin folds down this neck and on his hips. Fleece is PACKED on – providing full coverage nose to toes. • Extreme FINENESS! – AFD on cria tips 14.27! 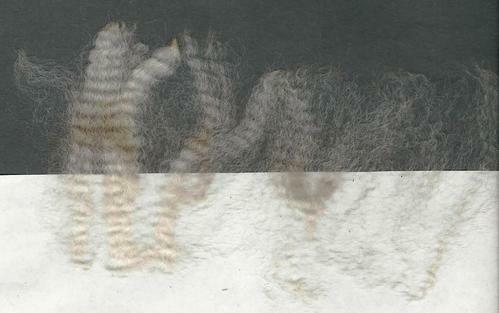 Most alpacas w an elite AFD do not “feel dense” because each fiber is so thin, but not this guy – DENSE DENSE DENSE! Cordina is a beautiful Full Accoyo Michelagelo Daugher. Her dam is Cordera a pristine FULL ACCOYO ribbon winning female with genetics that are loaded up with alpacas that are multi champions that have made multi champions – proving these genetics are potent and passed along! On top of them being an elite list of ACCOYOS, they are also ones that have covered COLOR (Royal Fawn, Mariah, Augusto, Arctic)!! Cordina has wonderful density, brightness, coverage, square and balanced frame, heavy bone. She has been bred to LLC Accoyo Jackpot for a 2016 cria. LLC & TKAF Black Accoyo Jackpot is the ONLY SOLID BAY BLACK FULL ACCOYO MALE ON EARTH! Yes Sir – No Contamination! Truly EXTAORDINARY in EVERY SINGLE WAY! Dam: ACCOYO Aurora, a dark fawn out of Leon who is a SUPER STAR & carries a powerful black recessive gene that is the GATEWAY TO BLACK SOLID FULL ACCOYOS! She is 14 yr old & gorgeous. Amazing conformation –flat backline, straight legs, short square nose, full top knot, & still carrying tons of DENSITY & FINENESS that was est. last yr at a 25 micron. Sire: Bullion is a multi champion med fawn male who sold for six figures. He is remarkable w density, fineness, coverage, luster, conformation & GENETICS! Bullions sire is the acclaimed ACCOYO GOLDSMITH, a household name, champion making male who covers BLACK & still looks terrific. Bullion’s Dam, ACCOYO Hannah, is the cornerstone of the Legacy Criations ACCOYO breeding program making nothing less the super star multi champion progeny. She’s out of Express –highly sought after genetics & known for all his champion progeny who ALSO covers BLACK.